Hi! 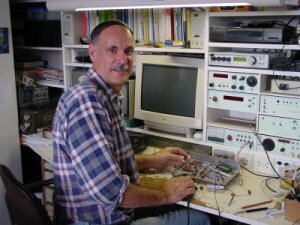 My name is Rob Engberts, born in Groningen (in the northern part of the Netherlands) in 1948, the year that the transistor was invented! I learned the radio hobby from my father, who liked also to experiment with receivers and transmitters. Also fox hunting with an 80-meters receiver was one of his favorites. Electronics was actually his profession. He was a designer of LF-amplifiers and transformers and later on he designed test equipment for civil aircraft parts. Designing was a challenge for him: he invented, and built, together with good friends, the most fantastic things. At home In 1951 we watched the first Dutch TV transmissions on a home made TV-receiver, made from an army navigation set (GEE-set). The picture was green and about 20 centimeters in diameter. When the TV was not in use to watch television, it was switched over to an oscilloscope used by my father to carry out his experiments. In that time my curiosity to all what had to do with radio and TV reception was growing. During foggy nights, we checked the different VHF TV channels for signals from foreign countries. Very often signals from Germany, Belgium and Spain were visible on our B/W television. On an old home radio receiver I listened in those days to ‘Scheveningen Radio’ (Dutch coast guard) and to the East-German lady who, in a monotonous voice, enumerated numbers. On that radio I heard my first Ham Radio Amateurs on 80 meters. In 1974 I did my Radio license examination and on the first of January 1975 I got my call sign: PA0RWE. In that time I started to build my first 2 meter transceiver. In 1981 my wife Yvonne and I moved from Amstelveen to Alphen a/d Rijn. Because of the new environment, the radio hobby became on a lower place. Also the introduction of the PC was so interesting that it pushed aside my interests in Ham Radio. After we moved to an other place in Alphen a/d Rijn, I got the possibility to setup an antenna for 2 meters and from that time the radio hobby started again!